The boiler barrels are now in the boiler shop. The first job is to swage the ends of the taper barrel truly circular so that the front barrel section can be fitted into the small end of the taper barrel and the two can then be drilled and riveted together. The larger end of the taper barrel in due course will be fitted to the front of the firebox, when this arrives from Devon. 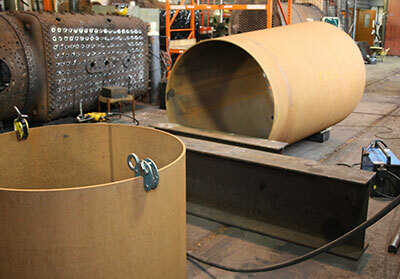 Various holes need to be cut and prepared in the barrels for components such as the dome, regulator rod, top feed clacks. The cab will soon be removed from the chassis for completion to be followed by cleaning and painting. The cab floor steel work is also close to completion. Some initial reaming of the cylinder mounting holes has taken place but it is anticipated that one cylinder at a time may have to be removed in order to ream through to the remaining cylinder with a long drive shaft driven by the magnetic base drill. Some components for use with the optical alignment equipment are being made in order to reduce the setting up time when we borrow the equipment from the SVR’s full time staff. Once this is done we propose to hire some equipment to true up the horn faces in the chassis to acceptable tolerances in order that work on fitting manganese liners can proceed. 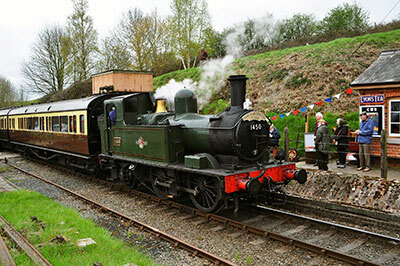 We ran our second fundraising special on 22nd April, again with 1450. Despite a last-minute hitch which meant we couldn't have the advertised coaches, all went well and the weather at least stayed dry. The train was run to raise money for 82045's return crank rods, and though we haven't totted up the final result yet, it's pretty certain that the Flyer produced enough to fund the rods to at least 80%, which was an excellent result. The event was again a sell-out, and special thanks are due to Bryan Clarke and his little team of Steve Downs, John Gupwell and Gareth Price for all the work they put into organising it; also to Steve Downs and the Eardington gang, who pulled out all the stops to make their lovely little station a welcoming venue for well over a hundred people. In addition to raising money for the Riddles tank, Steve's Eardington Station fund, which aims to finance the reinstatement of the single platform to its original length, also benefited. Two worthy causes in one! Bryan is mulling over plans for a third special train to run next spring, and has a very different format in mind, though still with Eardington as the centre of attraction. Watch this space. 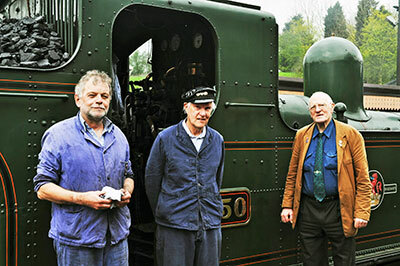 And the footplate ride winners were, Brian Moore, Alan Garbett and Ted Arnold. We were given a piece of excellent news on the day before the Flyer ran: namely, that the next SVR Raffle is to be held for the benefit of 82045. 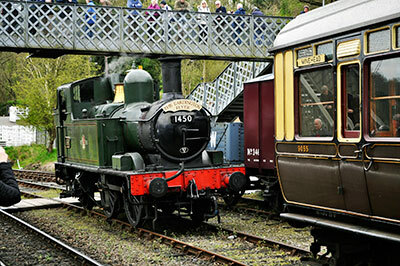 Sticking with the theme of motion and valve gear, this raffle will be to raise funds for the slide bars and crossheads. 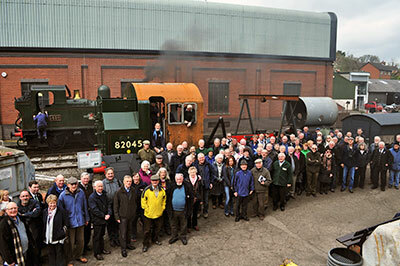 The last one raised over £17,000 towards the cylinders, so fingers crossed for another good result, and many thanks to the SVR Guarantee Company for supporting the Trust again. The raffle will be appearing in the near future. This year's AGM was very well attended, with around 70 people filling Kidderminster Railway Museum's upstairs lecture theatre. As usual, it was a pleasant afternoon and we were able to report on a good year of progress, the only bogeyman being the problems we (and everyone else) are experiencing with contractors taking too long to complete jobs. Easter 2017 is in mid-April (Good Friday is April 14th), so as soon as we can ascertain when the SVR's spring events are scheduled to take place, we will sort out a date for next year's AGM and let you know as soon as possible. 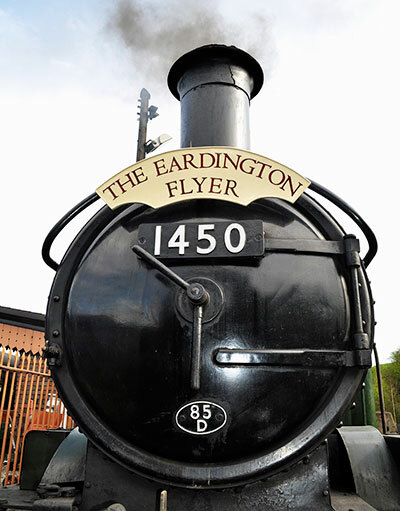 A selection of images from this year's Eardington Flyer. Tony & Chris are pictured with Brian Moore one of the fooplate ride winners. All photos by Ivan Whitehouse. A nice video of the day produced by Alan Parr.